This is the third and final post on why, with what, when and how to minimise mite levels in colonies in midwinter. In the first post I explained why midwinter mite treatment makes sense. In the second I described how oxalic acid-containing solutions should be prepared and stored. “Oxalic acid-containing” solutions includes both Api-Bioxal, the VMD approved treatment, and the unadulterated chemical. All three posts focus on trickling or dribbling – I’ve covered sublimation previously and both are essentially equally effective. Sublimation or vaporisation is currently very fashionable … but trickling is simplicity-itself and requires almost no special equipment. In this post I’ll discuss how to administer the oxalic acid-containing solution. For readability I’ll use the term OA solution to mean any oxalic acid-containing solution. About 50% of the readers of this site are from outside the UK; local rules may determine what you are or are not allowed to administer to your bees. You’ll hear both terms used interchangeably1. The general principle is that you directly administer 5ml of a 3.2% w/v solution of oxalic acid in thin (1:1) syrup per seam of bees in the colony. ‘Directly‘ because you administer the OA solution to the seam of bees. You don’t count the seams and then simply pour it into the hive. You don’t spread it across the top bars. The idea is that the bees at the top of the seam get coated in the solution and that it dribbles down through the colony, being passed from bee to bee as they feed and groom and move about. During this process any phoretic mites will also get exposed to the oxalic acid. Since mites are readily damaged by the OA solution they fall off and gradually drop out of the bottom of the cluster. Gradually, as it takes a few days for gravity to deliver all the corpses. You can therefore determine whether mites were present and killed by placing a Varroa tray underneath the open mesh floor of the hive. Note that this doesn’t tell you how effective the treatment has been … for that you’d need to know the mite infestation level before treatment as well. In many ways this is the critical decision. As described previously, maximal benefit occurs when the colony is broodless. Ideally you want an extended cold period late in the calendar year. The colony will cluster tightly and brood rearing will slow down or stop completely. If the cold period has lasted 2-3 weeks, even better. This will mean that some or all of the brood present will have emerged. The more sealed brood present, the less effective trickling OA solution is as a means of controlling mites. Choose a calm, cool or cold day. I usually wait for a day with temperatures between 0 and 5°C. Much warmer than that and the cluster starts to break up or the bees are more likely to fly about as the crownboard is lifted. Windy or wet days disturb the bees (at least when you prise the crownboard off), so it’s best to avoid those. I prefer to treat before the year end, rather than after, if I can. From a few irregular midwinter peeks into the cluster I think queens start laying earlier than most beekeepers think. … Aesop (~620-560BC) was right, though he wasn’t talking about beekeeping. Before treating your colonies there is some preparation needed. Do this properly and it’s a doddle. Purchase a Trickle 2 container from Thorne’s. These are a measly quid each. You’ll only need one. Practice with the Trickle 2 container (see below). Gently warm your pre-prepared OA solution to about 25°C. If you made it up in advance and stored it at 4°C in the fridge this will take an hour or two. The easiest way is to stand the container (preferably thin-walled … I use a well-rinsed milk carton) in a basin of warm water. 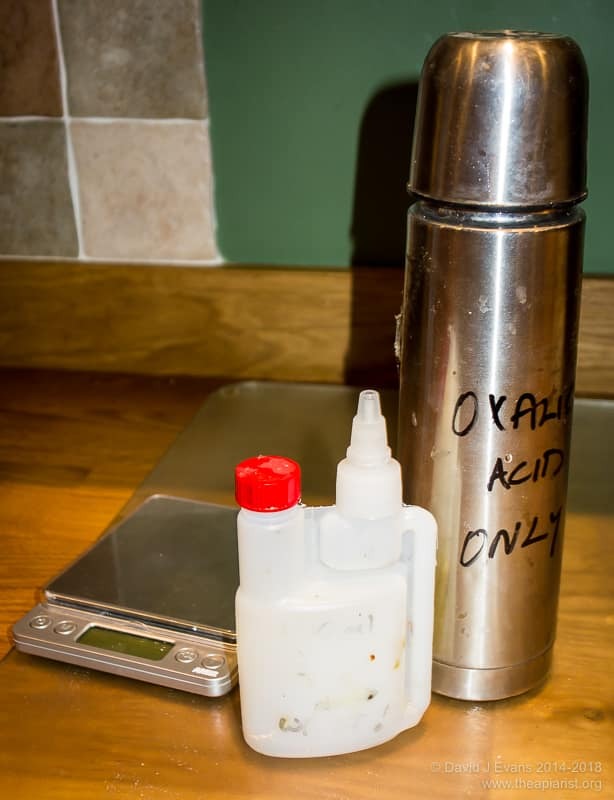 Pour the pre-warmed OA solution into a well-labelled vacuum flask. You can buy these from Tesco for £2.50 with a capacity of 1 litre. The aim here is to take everything you need ready-prepared to the apiary so the treatments take the minimum time possible. Remember that OA is toxic. Label everything carefully, make sure children can’t get near it and don’t use it again for food/drink purposes. That’s it … you’re ready. You’ll need a hive tool, a bee suit, thin gloves (to protect you from the OA, not the bees), your vacuum flask of OA solution and the Trickle 2 bottle. By all means take your smoker, but you shouldn’t need it. I’ve got a 5 ml (or 25 ml) syringe … won’t that do? A Trickle 2 bottle holds 100ml of prepared OA solution. It takes two hands to fill the bottle, but only one hand to use it. That 100ml is sufficient for 20 seams of bees i.e. two completely full colonies (assuming an 11 frame National box). In midwinter the colony is unlikely to occupy 10 seams. A Trickle 2 bottle is also pretty accurate, reproducibly dispensing about 4.6-4.8ml of liquid. That’s close enough to 5ml. In contrast, a syringe also takes two hands to fill (and refill). However, unless it’s a 5ml syringe, it’s difficult to accurately and reproducibly dispense liquid without using two hands. A 5ml syringe gives you the necessary accuracy, but needs refilling for every seam of bees. This takes time … during which the crownboard is off and the colony is getting chilled. I’ve done both and can assure you that the Trickle 2 bottle is much better. Just buy one. It’s only £1 and it’ll last ages if one of your association members doesn’t borrow it … or doesn’t return it. Remove the cap and fill to the top of the lower chamber with liquid (practice with water). Hold the bottle with your thumb and fingers on opposite sides of the lower chamber, with the external ‘pipe’ to the upper chamber next to your palm. Undo the spout about a turn. Gently squeeze the lower chamber. Liquid is forced up the pipe into the upper chamber. Hold it against the light to observe this. Once the upper chamber is full, stop squeezing. Excess liquid drains back into the lower chamber. If you are right handed turn the Trickle 2 bottle anti-clockwise2 using your wrist and gently squeeze the bottle to dispense the liquid in the upper chamber from the spout. If you’re left handed you need to turn the bottle clockwise. The single-handed operation for the Trickle 2 container really pays dividends when treating a colony. You can gently prize up one side of the crownboard, hold it in one hand, administer the OA solution to each seam with the other hand and gently lower the crownboard back down … all in less time than it took me to write that. 33 seconds of warmed, acidic goodness to slaughter the mites and give the colony the best possible start to the upcoming season. Discard any OA solution that’s not been used. Warming it will have raised the HMF levels and this may be toxic for your bees. However, read footnote 3 for another way to avoid HMF buildup3. Wash everything carefully – the Trickle 2 bottle, the vacuum flask, gloves etc. Since the OA solution was in syrup everything gets sticky and gummed up. Clean stuff up, make sure it’s labelled and not going to be used in the kitchen and put it away until next year. Oxalic acid kills mites, but it’s also toxic for unsealed brood. This is perhaps unsurprising considering it has a pH of 1 (i.e. very acidic) and ‘naked’ larvae aren’t protected by the tough exoskeleton that adult bees have. This is another reason to treat during a broodless period in midwinter. In summer, swarms can also be treated with trickled oxalic acid-containing solutions before they have sealed brood. If a swarm arrives in bait hive, let it settle and start drawing comb on the foundationless frames. A day or so later treat it with oxalic acid by trickling. When I’ve done this I usually wait until late afternoon or early evening, so most of the bees are in the box. The colony obviously won’t be clustered, but the principle is the same – 5ml of syrup down each seam. Easy peasy. Effective. Swarms have a significant mite load, so it’s well worth treating them before they rear brood and give the phoretic mites somewhere to breed. Finally, it’s often recommended that a colony is only treated once per year with oxalic acid by trickling or dribbling. I’m not sure where this advice originates, but it’s probably wise. The discussion forums are awash with recommendations to ‘vape’ the colony, rather than trickle. Vaporisation, or more correctly sublimation, is a widely used method and has been in use for two decades. It’s currently very fashionable. I’ll write a more substantial comparison sometime in the future, but the following brief notes might be of interest. Sublimation can be done repeatedly with brood present (though there’s no peer-reviewed evidence of efficacy) and is both well-tolerated by the colony and is not toxic to unsealed brood. It requires specialised and potentially expensive equipment, both for delivery and personal protection. You can build your own vaporiser, but shouldn’t skimp on protection for the operator. With a well designed vaporiser and hive there’s no need to open the colony to administer treatment. In contrast, trickling requires only the Trickle 2 bottle and vacuum flask described here. Personal protection is a pair of latex gloves. It should only be conducted when the colony is broodless, should probably only be conducted once and does require the hive to be opened (albeit briefly). You’ll be told that vaporisation is faster. It isn’t. Watch the videos above. Even my Sublimox – probably the fastest ‘active’ vaporiser on the market – takes well over a minute per colony if you take into account sealing the box, moving the generator about, unsealing the hive etc. There are reports that sublimation is more effective, but the difference is marginal, and possibly not statistically significant. There is also a report that colonies are stronger in the Spring after sublimation, though this may be due to toxicity to open brood by trickled OA solution. If the colony is broodless this shouldn’t be an issue. I’ve used both many, many times without a problem. Across the UK I suspect more beekeepers trickle OA, rather than ‘vape’ (a word I dislike), though the vocal ones on the discussion forums currently favour vaporisation. What’s more important than how you deliver the oxalic acid, is that you do treat. Trickling OA solution is so easy and inexpensive that there’s no reason not to … and your colonies will be much healthier for it. 2 If you are left handed you need to turn the Trickle 2 bottle clockwise. Actually, to be pedantic, if you are left handed and holding the bottle in your left hand, turn it clockwise. It’ll make sense once you try. 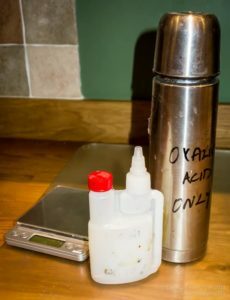 3 In the previous article on preparing oxalic acid solutions Calum posted a comment on preparing the OA in water and only adding and dissolving the required amount of sugar just before use. This has the advantage that there will be no HMF buildup. OA solution in water should be perfectly stable. I’ve not done it this way, but it makes sense and might be worth trying. The title of this article is a twist on the term Trick or treat. This is not entirely inappropriate as Trick or treating is a Halloween (31st October … just a few days away) custom dating back – in various forms – centuries. The modern usage, essentially North American, dates back to the 1920’s and refers to children in costumes going house to house threatening to play a trick unless the homeowner provides a treat, usually sweets or toys. In Britain these traditions date back to the 16th Century, both of children going house-to-house asking for food and of dressing up in costumes at Halloween. Closer to home, ‘guising‘ – children in Scotland going from door to door in disguise asking for food, coins or chocolate – dates back at least a century. The term Trick or treat only entered common usage in the UK in the 1980’s. This entry was posted in Beekeeping, Varroa control and tagged Api-Bioxal, cluster, dribbling, mites, oxalic acid, Trick or treat, trickling, Varroa, winter on October 20, 2017 by David. This short series has been very interesting and useful. Thanks. I’m on brood and a ‘alf and have seen differing opinions on whether to split the brood and do both boxes individually. What’s your opinion? I’m leaning towards not doing this – too much disruption at what will be a very cold point of the year. But I would be interested to hear your thoughts. On brood and a half I wouldn’t split the boxes. On double brood I might, but I’d need to be reasonably convinced that they were significantly occupying the lower box. I usually have a reasonable amount of top insulation and they often pack in across the frames high up in the hive. Just planning when to do this on my hive. I read different articles on what day to do it. Your suggestion to do it 0-5 degrees makes sense as bees won’t be flying but when you take the crownboard off if they are clustered as in your video will they remain clustered with the disturbance? Is there a risk of them flying with out survival due to the disturbance? I am torn becuase some advise says wait til 7-10 degrees but then they are less likely to be clustered. Inevitably you are going to disturb the colony. A few bees will fly. It cannot be avoided I’m afraid. Most will return successfully via the hive entrance. Don’t lose sight of the greater good … the disturbance may result in the loss of a few bees, but the entire colony will benefit from lower mite levels. I choose to trickle/dribble when the temperature is low and sublimate when the cluster is broken due to higher temperatures. I was at my colonies a couple of days ago and – despite it being less than 2 Centigrade – there were bees flying in the weak winter sunshine. Don’t delay too much … I’m not sure where you’re based but I expect colonies will start rearing brood soon. After that, treatment becomes a lot less effective. Thanks so much David for the reassurance. I am in Edinburgh and am hopefully set to do the treatment tomorrow.